I learned a secret from living a hell of a life. Nothing is what it seems. You can turn things upside down and inside out and discover your life is all about how you perceive it and less about what actually happened. The recall of your past is what you created in your imagination; it’s the event plus your reaction to it, and how it affects you today. How you choose to recall the information in the present is critical to your happiness, success, and love. As we hit a new year, consider taking this opportunity to use your creative mind to question, prod, and call out those things that hold you hostage and prevent you from pushing past the difficulty and into the new world of possibility. In the hardest way possible, I discovered perception is everything. I had a fairy tale life and then I suddenly lost my 16-year-old son to a deadly form of bacterial meningitis. I thought I’d never live life fully again. How could I? Let your perception do the work. 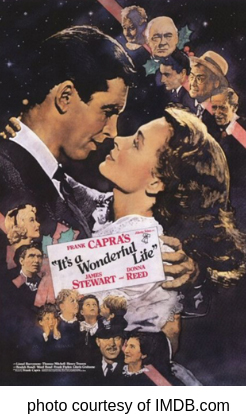 I discovered a remarkable way of making your past work for you from one of the greatest movies of all time, “It’s a Wonderful Life” directed by Frank Capra, starring Jimmy Stewart and Donna Reed. (You’ll see how you can use this tool in your life at the end of this article). It’s the story of George Bailey, a man who grew up in the small town of Bedford Falls. He struggled with feeling his life was a big fat disappointment. When he once had visions of graduating from college, building skyscrapers, and traveling the world, those dreams died when his father had a stroke. George was forced to step in and take over the family banking business. That choice tied him forever to the small town he so desperately wanted to leave. Over the years, George’s bank lent people money to help the town’s people achieve their dreams of home and business ownership. Often George made the decisions on a hunch, with no collateral backing it up. Tragedy colors everything dark… even what is light. Then one Christmas, tragedy struck the bank when George’s uncle accidentally misplaced funds. The loss would deeply affect the town. It also put George at risk of losing everything he’d spent his life building. In the depths of despair, he was ready to jump off a bridge into cold raging waters. Along comes divine intervention-a guardian angel named Clarence. Clarence had magical abilities and demonstrates them when he takes George back in time and reviews his life from the beginning. He shows him how different Bedford Falls would be if he’d never been born. People want to believe their lives matter. This movie placed number one on the list of most inspirational films of all time, and I know why. It’s because people want to believe their lives matter; that somehow, something they did had lasting impact. I was taught to get an education, have a plan, and set goals for a great life. Did you hear that too? Didn’t you think life would be perfect if you followed that plan? That kind of thinking never prepared us for the unexpected. That’s why George Bailey struggled. None of his dreams worked out the way he planned. When you’re in your darkest hour, standing on the bridge of despair, consider looking at your past with new eyes. I was at that bridge when I lost my son. I never expected to fit his life into a container of 16 years, 3 months, and 10 days. What I couldn’t see then, was the lasting impact my son’s life would have on me, and others who knew him. When he died, I kept hearing people say, “Don’t worry, time heals all wounds.” But it never made sense to me. As time went by, I became more aware of my losses and the struggle it took to survive. Time has a gift, it’s reflection and perception all wrapped up, ready for you to receive on the day you decide next year will be different. We have a choice as to whether an incident in our lives will hold us hostage or allow us to see life in a different way and move forward. Notice I didn’t say “move on” because people said that to me and I hated it. You never “move on” from devastating loss. But you can allow it to change you in ways you might not expect. When you’re in the darkness, you can’t see the effect you’ve had on other people’s lives because it’s shrouded in pain. Reviewing your life offers something you hadn’t seen before… your impact. Clarence the angel gave George a life review. He took him back in time and gave him a very different perspective. He saw himself as a teenager working at a pharmacy. Young George noticed the pharmacist prepared the wrong prescription for a child and intercepted the delivery. The pharmacist was angry, but George’s quick thinking saved a child’s life that day. Clarence reminded George he risked his own life by jumping into the river to save his brother from drowning. His ear was permanently damaged and prevented him from joining the military. But his brother could, and he went on to become a hero, saving many lives. When George put away his dreams of travel to become a family man, a visionary for the townspeople and a friend to all, he was living the results of what love brings, but he couldn’t see it through the troubles of the bank crisis. 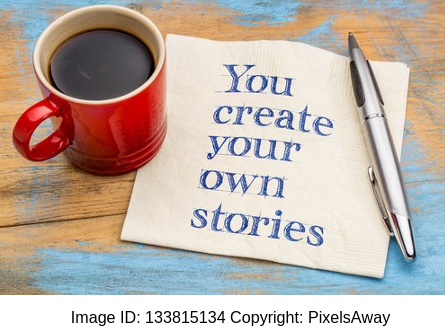 Here’s the secret… Create your own version of your life story. Our past may seem like a series of random, reactive, and chaotic incidents, but reviewing your life can awaken a new sense of appreciation for the life you’ve lived. Further on, I will give you the steps to replay your life with new appreciation. There are always different ways of looking at an experience. I began to look at the subtle hidden memories from my past. I thought these experiences didn’t matter, but they clearly transformed my abilities to become the person I am today. During my life, I’ve always been a people pleaser. It was hard for me to accept help because I didn’t want to believe I needed anyone. Never was it more glaring than when I lost my son. In looking back on my timeline, I know why. My father was in the Navy, and we moved 12 times before I reached the age of 12. Because I now have the gift of reflection, I can see many layers of its effect on me. Moving can be traumatic for children and can set up lifelong patterns of not belonging, loneliness, being an outsider. You are always starting over. I was afraid to make close friends, for fear of the loss I felt when we moved. However, moving was beneficial to me, too. I got used to being uprooted and traveling. It gave me a sense of adventure! I had no qualms about leaving home at 16 to join a musical show that toured all over the world. It gave me an incredible worldview and I made worldwide friendships at a very young age. My travels opened my heart to become more confident, to have an appreciation for different cultures, and to connect with love and compassion. But what about loss… how is there ever a way of resolving such incredible pain? Losing a child is the hardest experience I’ve ever been through, and it doesn’t go away. But there are many layers to it. The intense pain doesn’t happen as often as it once did, and there are windows into that sorrow that allow me to still connect with him. A mother’s love never dies. Surprisingly my love for my son has continued to grow as though he is still alive. What a gift. His loss helped me connect with those I love on a deeper level. Through it I learned that my family and friends are my treasures and their support lifted me up when I couldn’t do it myself. No child dies without leaving a message and a purpose for those that are left behind. I felt a calling to give my son’s life… and his death, meaning. I had previously written three books, but his loss inspired me to write the hardest book of all… How to Survive the Worst that Can Happen, A Parent’s Step by Step Guide to Healing After the Loss of a Child. My satisfaction comes from knowing my story has helped others survive. Are you beginning to see the structure of life… how one thing leads to another and another? George Bailey’s temporary business troubles stopped him from seeing the truth and light in his life. He had been a gift to many, and he was already living a wonderful life. It just took seeing it from a new perspective. How amazing it would be if we could all have that review of life to reframe, rewrite and live a “wonderful life,” today. Here’s the greatest tool of all… your own life review. Press the replay button and do your own life review with a paper and pen. By doing so will bring about awareness and potential for course correcting and navigating this next year and beyond. Write what each of those events taught you. For example, my daughter was born with a cleft. I was devastated then, but I learned so much and discovered my desire to write books for others going through similar experiences. It was my door to becoming a writer. Ask yourself, if I were to change the way I think about the negative incidents in the past, who would I be? Your past is over, and you get to release the hold it’s had on you by gaining new insight. Like George Bailey, if he hadn’t made the choices he made in spite of his tragedies, Bedford Falls would be a very different town. Do you see how you can shift your thinking about incidents that you thought only gave you one option? Positive or negative… it’s a blend of both that created your life story. Make a list of things you’ve done that have had an impact on other people’s lives. This is where your hidden legacy lies. Write down all your talents, good qualities, and things you do well. Did any of these come as a result of a positive experience? A negative experience? Is there something you can do with these attributes to elevate your hopes and dreams for this next year? 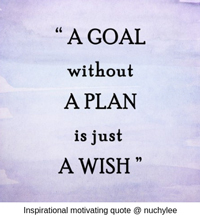 Now write down 5 to 7 opportunities and goals you’d like to create with your new perception. Give them a start date and a completion date. This is when it gets real. This is your future talking. Your life is sacred to you. No matter what you’ve been through, you’re still standing. Things may seem a little unsteady, but your next bold step is to commit to seeing things through new eyes. My son died, but I survived. I can even say I have a great life. It happened when I began writing my book. It became my son’s legacy. Whenever a parent contacts me and says, “I felt so alone, then I read your book and found hope.” Right there is my son sending me a postcard that he lives on. There’s never a time we can count on things happening the way we plan, but we are on this planet to live a good life and make an impact. Look for the clues to the imprint you’ve made, I’m guessing you have quite a lot to be proud of. Isn’t it time to take the starring role in your own wonderful life? Please feel free to share this article! I love writing about creativity and inspiration. If you’d like to establish some simple habits to set your creativity on fire and receive occasional emails from me, click here: How to Develop the Creative Mindset to download my free ebook.